Gallman & Gallagher, eds. : "LENS OF WAR: Exploring Iconic Photographs of the Civil War"
Lens of War: Exploring Iconic Photographs of the Civil War is another fitting entry in Georgia's UnCivil Wars series, which has carved out a bit of a niche for itself publishing titles off the worn paths of Civil War publishing. The big idea is that contributing editors Matthew Gallman and Gary Gallagher would invite another 25 other historians to join them in selecting a photograph and writing an essay about it. The cliche that a picture is worth a thousand (or more) words certainly applies here and it's clear that photographic images have long possessed the ability to inspire budding Civil War scholars in ways unavailable to young minds discovering for the first time earlier conflicts like the American Revolution and the Napoleonic Wars. All contributors were offered complete creative freedom in writing their accompanying essays. This could have been a mess for the editors but it turned out well in this case. Format is elective, either formal or informal and with or without scholarly notes. Many chose to explicitly personalize their essays by writing in first person and nearly all fell back on their training and included chapter notes. The convention for essay collections large in number is to divide them into sections and that's done here, with dutiful grouping into five parts (Leaders, Soldiers, Civilians, Victims, and Places). These categories suggest the full range of images and there's no need to go into specific examples here. The book's subtitle refers to "iconic photographs" but there are some fairly obscure ones in there, too, although one supposes that most readers that have been Civil War enthusiasts for a long period of time will have seen then all before at some point. As one might expect given the amount of free reign involved, the essays vary widely in style and approach. The images are very often deconstructed in a detailed manner, either literally or along thematic lines. Some authors delve more deeply into historical background information than others and many use the power of the photograph to explore grander social, military, political, racial, class, and gender themes of interest to today's scholars. Some wander off into quite tangential territory. Most make an attempt to identify and profile the photographer. The degree of speculation involved also varies. Facial expressions and their underlying meaning are frequently interpreted with (undue?) confidence because it's probably more fun that way but others more cautiously assess the human gazes reflected in the images. Not in the book, but a reviewer favorite. Many of the writers note the staging (often quite elaborate) inherent in their particular selections. Viewing the iconic photographs in the book in this light, one appreciates even more the few successful spontaneous "action" photos of the war like the unique scene (at right) of a heavy column of Confederate soldiers tramping through a Frederick, Maryland street during the Maryland Campaign in September 1862. It's difficult to imagine a Civil War enthusiast of today who lacks a deep curiosity in the photographic legacy of the conflict and Lens of War is highly worthy of recommendation to history students of all levels. The editors do mention that their book isn't intended to be read mechanically from cover to cover. Reviewers unfortunately don't really have that luxury but this one would agree with the editors that the volume is probably best experienced in short bites during casual revisits. Upon finishing this photographic study, the question surely arises in the mind of every reader as to which particular image he or she would choose if fortunate enough to have been asked to participate in the project*. * - Readers, feel free to offer your own choice in the comments section. 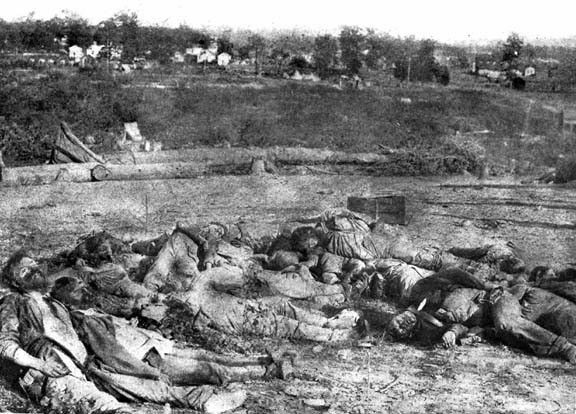 Mine (which, by the way, found its way into the book as T. Michael Parrish's selection) is the disturbing photograph (below) of Confederate dead from the Battle of Corinth, arguably the most evocative image of the scale of death involved in Civil War battles and the physical indignities suffered by the corpses of those killed in action. Curiously, Parrish points to Colonel William P. Rogers (at far left in the picture) as one of only two positively identified bodies of the slain in all of Civil War photography, the other being Confederate cavalry general Turner Ashby. There's also a well known grisly death photo of Missouri guerrilla William T. "Bloody Bill" Anderson but perhaps Parrish does not consider him a "soldier" in the strictest sense. I don't know how to post photos in comments or if it's even possible, but I certainly do have my favorite Civil War photos. 1. A shot of two soldiers in an abandoned or empty camp. One of them is a Zouave with an arm in a sling. The look of pain and exhaustion in his eyes is unforgettable. Another soldier is kneeling next to him holding out a canteen. Given the long exposure time, I'm pretty sure it was a posed shot, with the photographer saying something like: "Hey, want to be in a photo? Hold this canteen up for this poor guy." Still, it's an image of suffering and comradeship. 2. 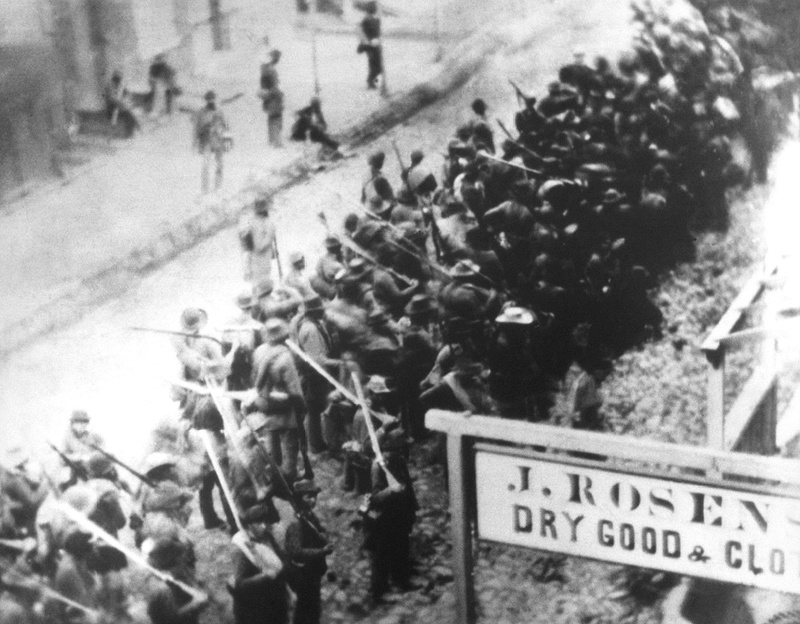 A shot from Richmond after its fall in April 1865. Three or four Union soldiers are standing on or around a damaged locomotive, all in profile looking to the right. To me it captures both the war's devastation and Americans' anticipation of what postwar held in store. 3. A full standing photo of U.S. Grant. He has one hand in a pocket and he's standing on a kind of platform which, according to Brooks Simpson, allowed for multiple-angle shots. To me there's no better image showing Grant's confidence and quiet determination. No picture attachments as far as I know. Those are good choices. In the book, Waugh chose the photo of Grant leaning against the tree. 1. The one of the reburial of (Union?) 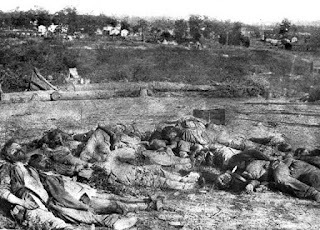 dead in the vicinity of Cold Harbor, with the African Americans digging in the background while one poses next to a stretcher full of skulls, bones, etc. It makes me think of the causes of the war, its cost, aftermath, just a range of different ideas and emotions. 2. One of the group shots at the crest/point of Lookout Mountain in which the Union soldiers are waving (or posing like they're waving) their hats over the Tennessee River valley. It conveys to me the spirit of adventure & fun the common soldiers preserved even in the midst of the drudgery of camp life and the horrors of battle. 3. The one of a what appears to be a soldier kneeling in a cemetery, head in hands, in front of a grave. Good ones. #1 is in the book. I don't recall seeing a photo like #3 before. I've tried to find it before, but not a really in-depth search. I'll try again and let you know. Not having much to do with the war itself, but one of my favorites is Lincoln visiting McClellan and his staff in camp after Antietam. It shows how ... unusual looking Lincoln was relative to the average American. McClellan and the other officers look like pygmies, but they outnumber him, so it kind of evens out. For me they are the series of three photos of Grant and Meade holding a conference outside Massoponax Church in Virginia during the Overland Campaign. They had taken the pews out into the yard and are obviously discussing a movement while supply wagons roll by in the background. In that last image of the dead at Corinth, the body laying against Col. Rogers is supposedly Capt. George W. Foster of Co. A, 42nd Alabama Infantry. He was said to have been killed by a canister shot through the back of the head, as appears to be the case in the photo. The rebirth of "Civil War Regiments"